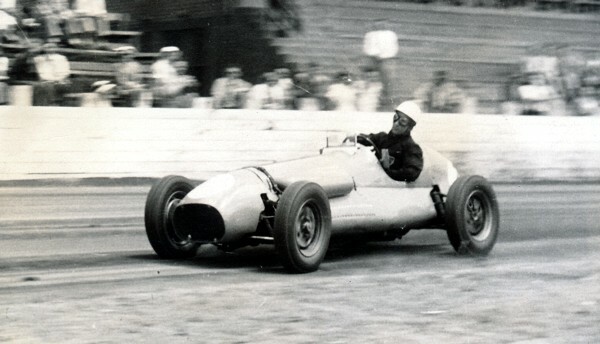 Jack Myers, a true legend in the history of Australian motor racing and motor trade. He ran the Lukey Mufflers agency at Kingsford NSW and started out motor racing a 48 Series Holden sedan in 1953 which very quickly became known as Australia's fastest Holden. The cream coloured Holden was a winner in Australian Sedan racing, as was Jack. A man who had great constructive input into The Australian Racing Drivers Club as Vice President for 4 years, who freely helped out his fellow competitors when asked and had great visions for road racing in Australia. Jack's Daughter Lois and Son Peter have assembled some of his memorabilia for us to enjoy. Thank you Lois and Peter. In 1956 Jack progressed from his Holden sedan into the accident damaged green ex Stan Coffey ' Dowidat Spanners' Cooper Bristol. 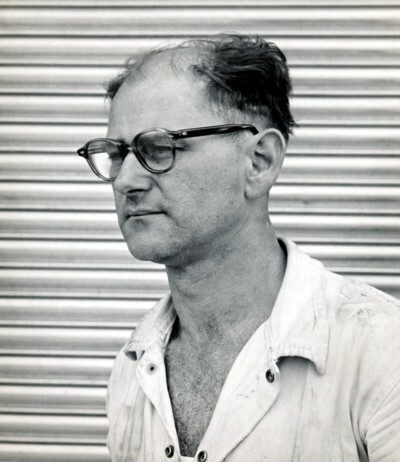 Then in collaboration with Sydney engineer, Merv Waggott, they developed and fitted a unique twin overhead camshaft cylinder head to a Holden 6 cylinder engine block, later to develop 197 B.H.P. and the car to top 148 M.P.H. A MKIV Cooper, into which he fitted two 650cc. 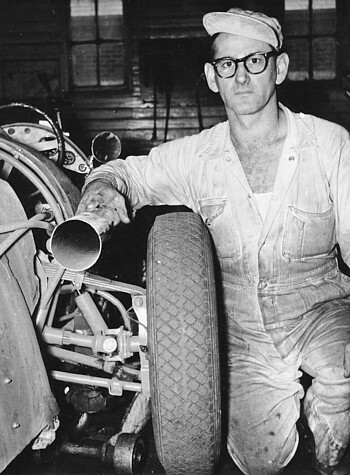 Triumph Thunderbird engines, Supercharged, and used mainly for Hillclimbs was his next race car. 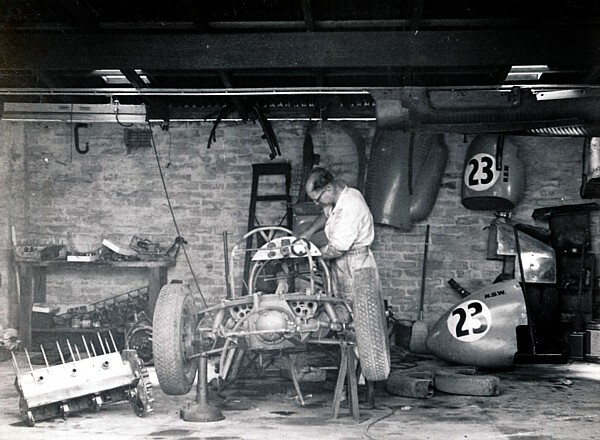 Then came his final car, a RALT based car incorporating his own ideas, a small rear engined car with the two 650 Triumph engines and Supercharged. Jack lost his life in the latter Triumph engined car at Catalina Park race track - Katoomba in the Blue Mountains of NSW on January 21st. 1962 - aged 44. Above: The 109.9 M.P.H. 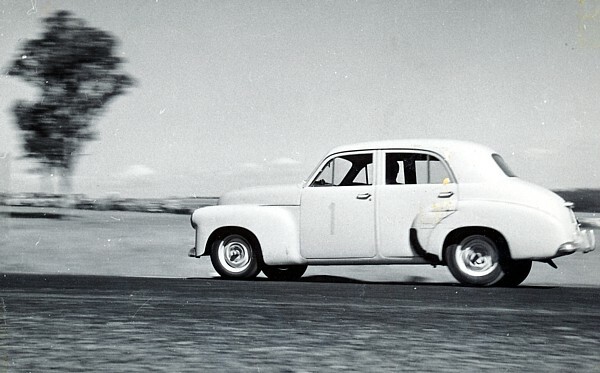 (on the back straight at the Orange - Gnoo Blas circuit) ) 48 Series Holden Sedan, in which he started his racing career, photographed during a road test with motoring writer, Bill Daly in 1955. 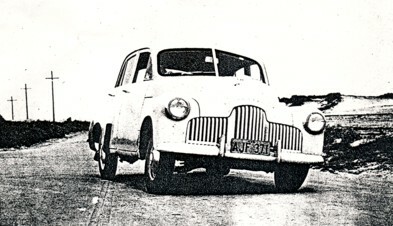 Jack and the 48 series Holden at Mt Druitt in the early 1950s. The early Holdens were not known for good handling. Note the body roll. 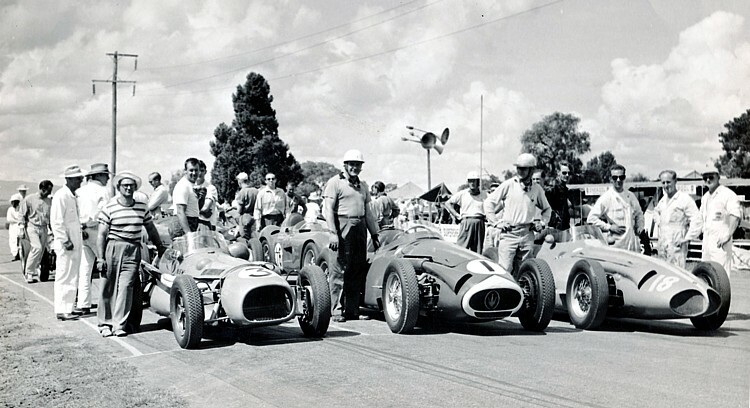 Jack Brabham in # 1 and Stan Coffey in # 4, the Cooper Bristol which Jack Myers was to buy after Coffey smashed it. The car was to be transformed into one of our fastest Aussie specials - The WM Special. 6 x 1-3/4" SUs - set up by the late Bill Bressington. This photo may even have been shot in Mayvic St. Greenacre where Merv Waggott had his workshop. the extra long head studs to accommodate the larger deeper twin cam head. The cast aluminium engine/gearbox adaptor is still mounted on the block. The WM ran an MG TC four speed gearbox. The TC box was a rugged gearbox and could absorb the high horsepower, although Peter Myers tells me that Jack had to have stronger gears than the TC originals made. Left: Merv Waggott (rear) and Fred Pearse discuss the new WM at it's first appearance. Mt Druitt Raceway - NSW - 1956. 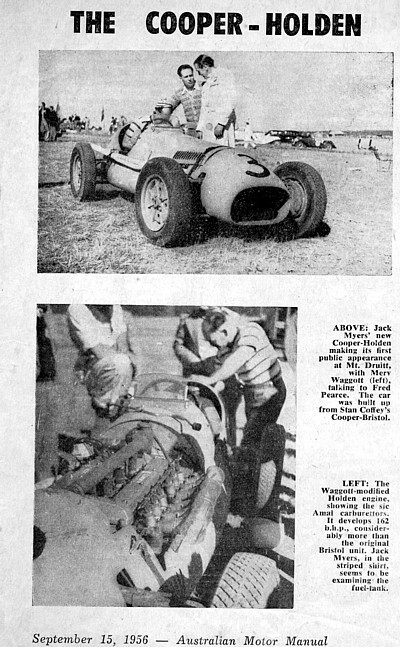 Left: Jack Myers wearing his 'famous' yellow and black striped tee shirt checks the fuel tank. The 6 Amal carbs can be seen on the Waggott head. Above: That's a lovely big pipe ! A very proud Jack Myers ( left) stands beside the WM # 3 on the front row of the grid for the 2nd. 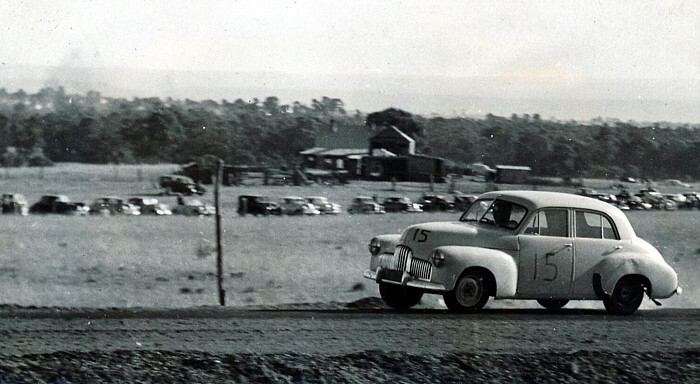 Qualiying Heat, over 3 laps, for the 1959 Bathurst 100 at Mt Panorama Bathurst NSW . 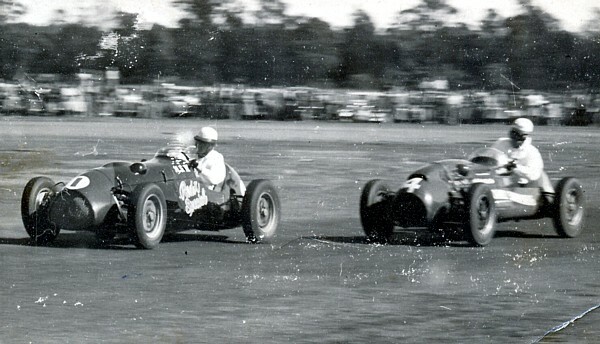 Stan Jones in the ex works 250F Maserati # 1 beside Jack and Ross Jensen from New Zealand with his blue and white # 18 Piccolo Maserati 250F, far right. Jack doesn't have his crash hat on but does have the driving gear of the day, a yellow and black striped tee shirt and brown casual sports slacks. Stan and Ross attired in a similar manner, although Ross has long sleeves !. Lois mentioned that Jack always drove in Sandshoes for a better feel of the pedals. Jack and the WM managed a credible 24 laps of the 26 lap 'Bathurst 100' later that afternoon. Jack in the Pits, wearing crisp white overalls with ARDC logo (still got the yellow and black tee shirt underneath! ) at what looks like Albert Park in Melbourne - Victoria. 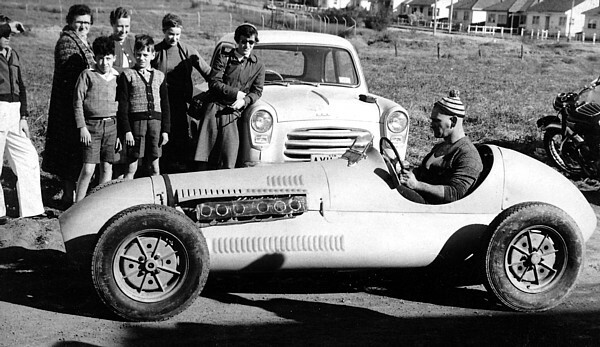 Jack and the WM were the only Australian 'Specials' to finish the 1956 Australian Grand Prix at that circuit that year. 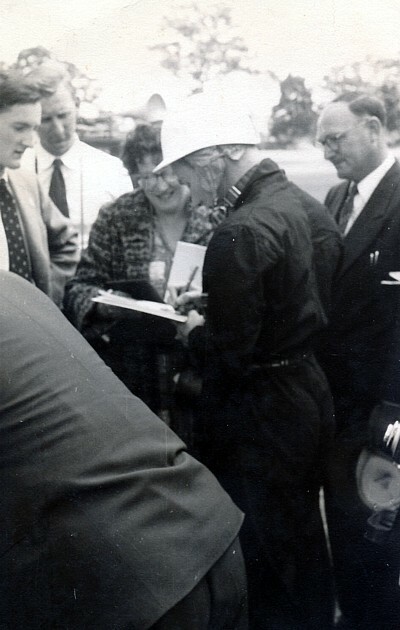 Stirling Moss signs an autograph for Jack's wife, Mrs Joyce Myers, after his run at Cumberland Oval. 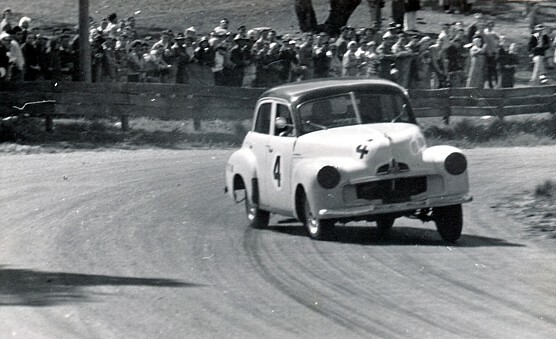 October 1958 - Jack drives the Thompson / Waggott FJ Holden at Mt Panorama - Bathurst NSW. Jack steers # 4 over the top of 'The Mountain' . 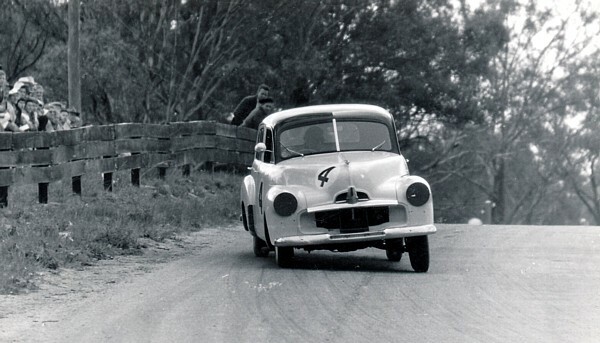 Jack in the # 4 Waggott Engineering Holden FJ - at the bottom of the Mountain - Mt Panorama - 1958. 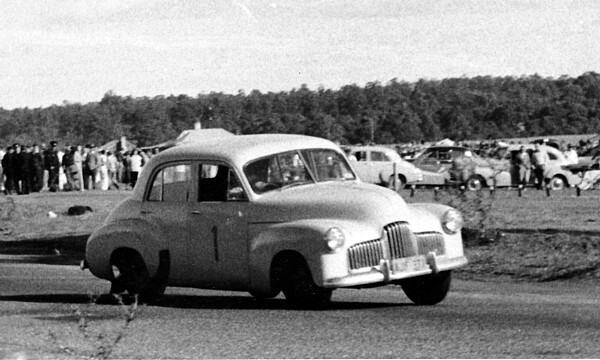 He was placed third in the 10 lap Handicap race next to John French in his Holden #8 2nd. and winner David McKay in the # 71 Ampol sponsored grey 3.4 Jaguar. On to Page Two - The WM in action. 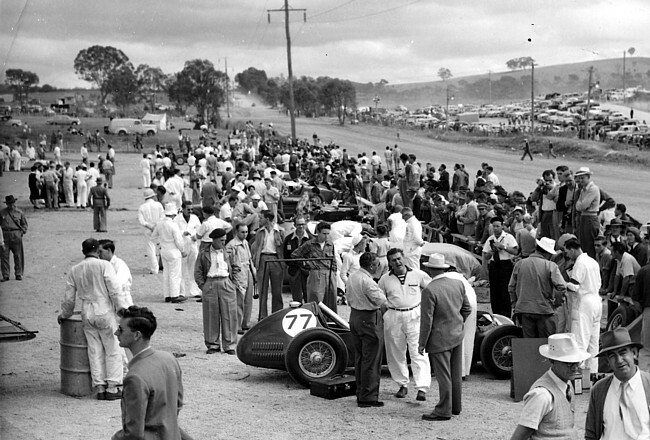 This busy scene is the Mt Panorama - Bathurst - Pits in 1955 - this is what Aussie motor racing was like in those halcyon days. Looking up the Starting Straight to the left hand Hell Corner - the approach to Mountain Straight. 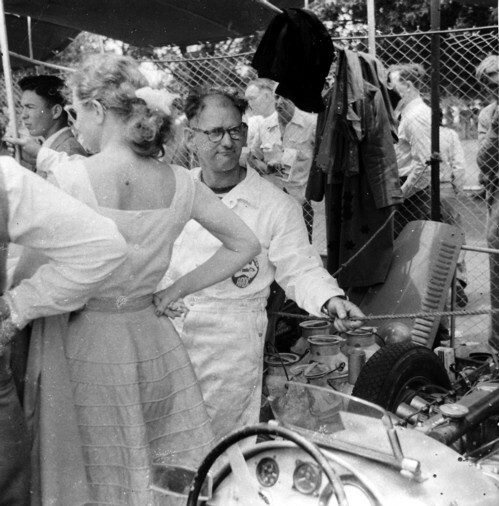 The open wheelers were always at the front of the pits, then the Sports Cars. Davison, Jones, Whitehead etc. were always nearest to the pit Exit. # 77 the HWM Jaguar of Lex Davison and that looks like Stan Jones in the white outfit ( right of centre).